A significant design made special for smaller spaces, this elegantly styled Emily Mini Crib by Da Vinci is the ideal solution for studio in the big city or smaller nurseries. 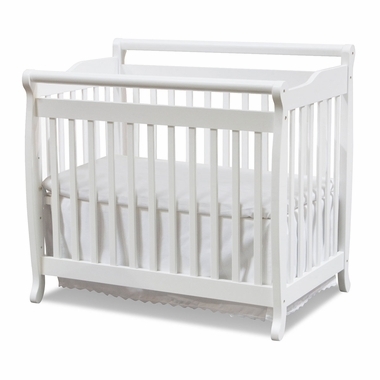 Finished in a clean white, this crib has endearing traditional charm with a modern flair. Da Vinci uses nonhazardous paints for parent's supreme peace of mind, and to protect the environment. The perfect answer for grandparents if you already own the standard size, get this one for a familiar and peaceful sleeping space away from home.